For many years, vegan friends often ask me when I will branch into baking for vegan diets. Until this year, the best that I could do to accommodate is an occasional fruit crumble or poached pear. In 2008, vegan baking has finally arrived in my kitchen so it is only fitting that I offer a vegan version of my holiday cookies assortment. My experimentation with vegan baking is not without its share of success and failure. Luckily, with the help of some experienced vegan bakers, the whole learning experience really opened my eyes. My notion of baking fundamentals involving flour, butter, sugar, and eggs was challenged. I think I've become a better home baker because of this learning experience. Don't forget to check out the non-vegan holiday cookies assortment too! This is the very first vegan cookie I ever baked. I still remember my skepticism when reading the recipe for the first time. Can it be possible that the incomparable butter flavour be emulated by oil + maple syrup + molasses? Can the cookie maintain a cakey texture without the use of any eggs? 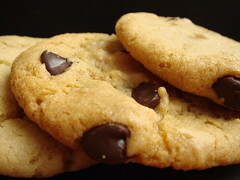 Chocolate chips cookies is as classic as you can get in North American-style baking. This version can rival any good recipes in terms of texture, flavour, and appearance. I adapt from the recipe available here. Unrefined sugar is replaced with light brown sugar for the molasses flavour and a finer crumb. What I like most about Dreena Burton's basic drop cookie recipe is the simplicity. The mixing method is a quickbread method which is done without a mixer so less washing and oh-so-fast! This batter would spread during baking so it's important to leave sufficient room when placing the batter on the baking sheet. Walnut and maple go together like milk and cookies. 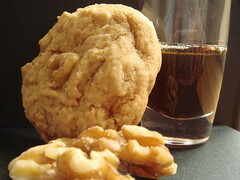 This drop cookie is soft so it is a little departure from the typical shortbread-based crumbly maple walnut cookie. However, the flavour is still very pronounced and it reminds me of a tea cake. I adapt from the recipe available in Vive le Vegan!. Unrefined sugar is replaced with light brown sugar. Recipe adapted from here. I added sweet dried cherries to the batter when the chocolate chips and almonds were mixed in. I also used light brown sugar in place of unrefined sugar. This tropical cookie is a hit in my house because of its citrus tang and coconuty crunch. 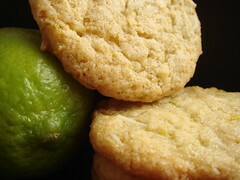 I think it is perfect for making sandwich cookies and a little spoonful of lime curd would be a wonderful filling. But of course, I have yet to figure out how to make vegan lime curd. Oh well, a project for another time! Recipe adapted from Dreena Burton's Vive Le Vegan!. Unrefined sugar was replaced with granulated sugar. 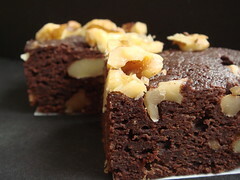 A decadent fudgy brownie should not be the domain of butter and eggs. This is one of my first foray into using silken tofu in vegan baking. Cooking the tofu and flour puree over the stove top reminds me of making roux. This smooth paste gives the brownie both moisture and structure. As you can see from the picture, the brownie is very moist with a fine crumb. Mind you, this is a rich treat and a small serving goes a long way. If you serve it with a scoop of vegan ice-cream, that's one quick brownie sundae to satisfy any discerning sweet tooth. Recipe adapted from here. I used 3/4 cup of finely chopped bittersweet chocolate instead of chocolate chips. I also added 300g of chopped walnuts to the batter. This is one seriously fudgy blondie bursting with plump bits of dried pears and candied ginger. The bright green of pistachio adds a nutty richness which makes the whole cookie unusually yummy. It is definitely my favourite. Recipe adapted from Maple Pecan Sticky Blondie in Dreena Burton's eat, drink & be vegan. 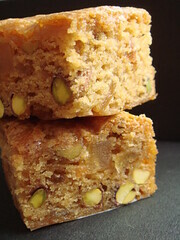 The use of pear, ginger, and pistachio is inspired by a blondies recipe in Martha Stewart. Be sure to chill the blondies before cutting to yield much neater cuts. 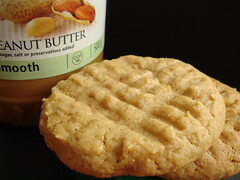 I was a little obsessed with finding THE peanut butter cookie a couple of years ago. In the process, I went through so many recipes and piled my tables high with peanut butter cookies of all kinds. This version of peanut butter cookie is not very assertive in peanut flavour. It is cakey and tender. I love the look of a sugar crackle cookie. 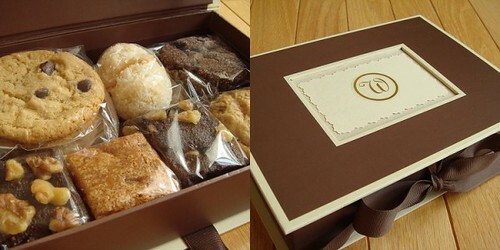 The sugary coating bakes up to a crunchy shell enveloping the cookie. 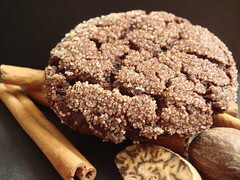 The spices used in this cookie included cinnamon, nutmeg, allspice, and cloves. Without a gingerbread in the assortment, the warm spicy note of this cookie is a welcome addition. 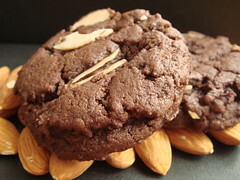 Recipe adapted from Chocolate Chunk Spice Cookies in Dreena Burton's eat, drink & be vegan. This is a bigger departure from the original recipe. I omitted the chocolate chunk. I made a little bowl of cinnamon sugar and then gently coated each blob of batter before dropping them onto the baking sheet.